SC16 is almost here! We're getting excited to heading to Salt Lake City, Utah, to be a part of this excellent conference. It's a great place for soaking up HPC knowledge, getting inspired, and connecting with the brightest minds in the industry. Here's a quick run-down of where we'll be. Visit our booth. We're booth #717 in the exhibit hall during exhibit hours November 15 - 17. We'll be showing off our latest demos and our engineers will be available for questions. Ask your questions, meet the team, or just bounce some ideas. Try our in-booth tutorials. Want to learn how to use ArrayFire to accelerate your code? 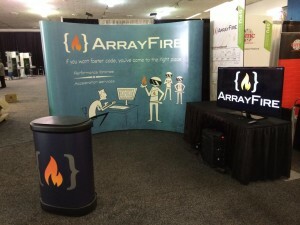 Stop by and receive an in-booth tutorial from one of our ArrayFire experts. We’ll show you how the open source ArrayFire software library makes programming GPUs and other accelerators fast and easy. Join us for a user meeting. ArrayFire is more than a software library—it's an active community. Come to one of our user group meetings to get practical tips for working with ArrayFire and to network with other ArrayFire users. Visit our booth for more details. Set up individual meetings. Whether you live across the state or across the world, SC16 is a great time to connect one-on-one with us. Set up an appointment to discuss your work with an ArrayFire engineer at SC using our meeting scheduler.